DivX is actually a video codec not a format. This codec is developed and provided by the DivX, LLC. This format is popular due to the ability of compressing the full length videos in different small size videos. This format is popular but there are not much media players available to play this format files on system. If you have many DivX format files then you may need to convert them in MP4 format to get the wide range of media players. Let’s see how to convert DivX to MP4 in this tutorial. To convert DivX to MP4 free without charge, an online converter will be the perfect one for you because they can easily convert your videos without any installation. KeepVid Online Video Converter is best one from these online converters. This convert enables you to convert DivX to MP4 free and 60 formats without any quality loss in the original quality with a very easy to web interface. KeepVid Online converter enables you to choose output format from the list of devices as well. Also, you can convert MP4 to DivX videos with the help of KeepVid video converter solutions, and you'll find them very easy to get the work done. There're many video converter programs available in the market, and they offer different features. 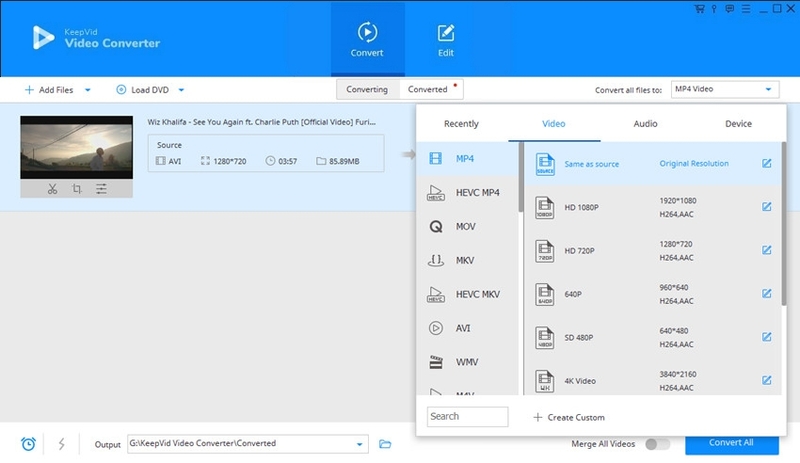 If you want to convert DivX to MP4 without losing your original file quality, you can use KeepVid Video Converter to get the work done. 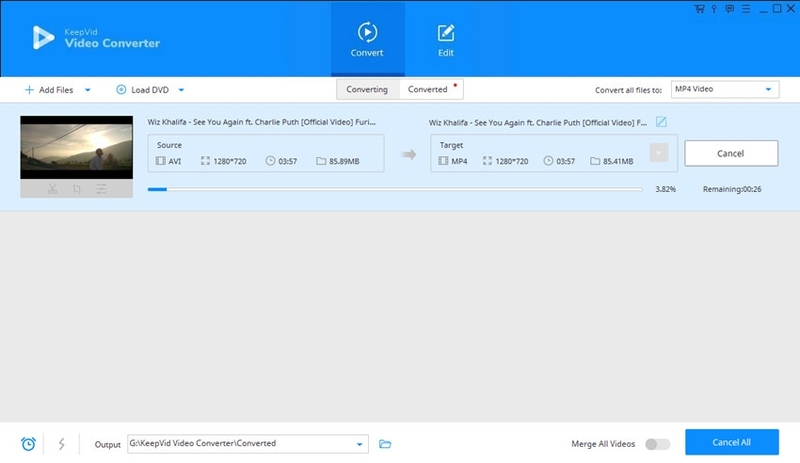 In this part, we're going to introduce you how to convert DivX to MP4 with the help of KeepVid Video Converter in detail. Edit videos with helpful trimming, cropping and other features. This converter can help you to convert HD videos up to 8K. Step 1 – Start KeepVid Video Converter and add the DivX file from your computer. Step 2 – Click the menu icon at the upper right side and choose MP4 as an output format. Step 3 – Click Convert button to start converting DivX to MP4 files. To convert DivX to MP4, firstly run the program after installation, and then click the “Add Files” button and choose DivX files from your computer. You can also drag and drop files directly. Now you have to choose the MP4 format so click the upside down in top right side next to label “Convert all files to” then select MP4 from the dropdown list. After choosing MP4 format, you only need to simply click “Convert All” button to start converting DivX to MP4. MP4 is a container format standardized by the Moving Pictures Experts Group. MP4 format can hold the audio, video, subtitles and images in a single file. This format is very common and very well known today. It is used on mostly all latest mobile devices and computer systems such as Android, iOS, Mac and windows computers. MP4 format is also used to spread the videos overt internet even YouTube is also playing videos in the MP4 format on YouTube.